Côte-Nord is an immense region that is home to a river that turns into the sea, abundant wildlife, huge forests, rushing rivers and larger-than-life scenery. From Tadoussac to Blanc-Sablon, Côte-Nord is nature writ large! Are you an outdoor lover looking for a complete change of pace? Here are four Côte-Nord attractions worth visiting. Over 100 km (60 mi.) long and from 2 to 3 km (1 to 2 mi.) wide, the Saguenay Fjord is one of the longest and southernmost fjords in the world. Created by collapsing rock over 175 million years ago, the fjord was gouged and polished by ice sheets and then flooded by seawater when the glaciers melted. Discover the majestic scenery surrounding the fjord during a hike in Parc national du Fjord-du-Saguenay. Several short trails run along bluffs of dizzying heights. Be sure to take advantage of a sea excursion in the fjord to admire its steep cliffs. At the mouth of the fjord, you may be lucky enough to spot belugas or a blue whale, the largest animal on the planet. Find out more about the Parc nationa du Fjord-du-Saguenay. Made up of about a thousand islands and islets strung along 175 km (110 mi.) of coastline, the Mingan Archipelago is home to strangely shaped formations sculpted by the wind and sea for over 450 million years! These limestone monoliths stand sentinel in the archipelago, creating a surreal and fascinating landscape. Participate in an excursion to the archipelago departing from Havre-Saint-Pierre, Mingan or Longue-Pointe-de-Mingan. The park is home to an astonishing variety of plants and animals and is a refuge for large colonies of birds, including the famous Atlantic puffin. You may enjoy exploring the archipelago on foot along its 24 km (15 mi.) of hiking trails; you can also sea kayak around the islands. Don’t hesitate to request a guided tour. This is a unique opportunity to learn all the secrets of this unusual site. Find out more about the Mingan Archipelago National Park Reserve of Canada. Some 220 km (135 mi.) 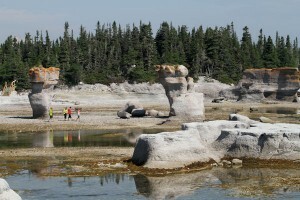 long, Anticosti is a fascinating and mysterious wilderness area. The island is home to spectacular canyons and steep cliffs, impressive falls that flow into crystal-clear rivers, deep caves that date back thousands of years and more! Despite its size (over 8000 km2 or about 3000 sq. 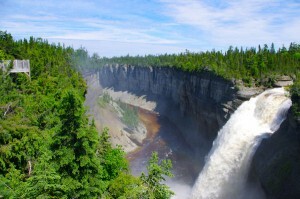 mi., which is 16 times the size of the Island of Montréal), Anticosti has a population of only 250 people. It is, however, home to 160,000 white-tailed deer! To fully take advantage of this enchanting site, stay in an inn, cottage or campsite run by SÉPAQ Anticosti or in a cabin or former lightkeeper’s house at the Pourvoirie du Lac Geneviève d’Anticosti outfitter. Both offer all-inclusive packages including lodging, airfare and a vehicle for the duration of your stay. Although Route 138 ends in Kegaska, you can continue your journey east along the coast of Côte-Nord aboard the M/V Bella-Desgagnés . This authentic supply ship will take you from village to village through the thousands of islands and islets of the Lower North Shore all the way to Blanc-Sablon. This region is a wild stretch of rocky coastline extending for 375 km (230 mi.) along the Gulf of St. Lawrence, which is as wide as the sea! The Lower North Shore will appeal to outdoor lovers, who can sea kayak, hike and observe wildlife, including seabirds and whales. Culture lovers will enjoy exploring a string of francophone, anglophone and Innu villages with intriguing names such as Tête-à-la-Baleine (“Whale Head”), Kegaska, Mutton Bay and La Tabatière (“Snuffbox”). This summer, set off to discover the natural wonders of Côte-Nord—and fall under the spell of this larger-than-life region!